Located just 30 minutes outside of San Diego, what began as a small ranching community, with the establishment of the Barona Reservation. The 310,000 square foot casino has 2000 slots and 63 gaming tables. Exquisite fine dining is the realm of the intimate Barona Oaks Steakhouse, a dinner-only venue that features such tantalizing items as Buffalo Tenderloin Carpaccio. Open 24 hours a day, the Branding Iron Cafe is the preferred destination for night owls and anyone with a yen for the more traditional staples of the classic American diner. The extended hours of the Ranch House Buffet, open daily for lunch and dinner, features all-you-can-eat international cuisine sure to satisfy any craving imaginable. 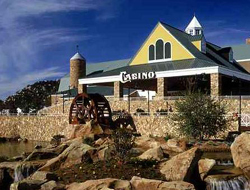 The ranch-themed resort, with its casino, 397-room hotel, championship golf course, lakeside wedding chapel, events center, many restaurants, and AmBience Day Spa.